I am an experienced, qualified tutor with over 26 years of experience in teaching Maths and Science across different boards including CBSE, ICSE, IGCSE and State Board. Passionate about solving mathematical problems, I have helped thousands of students overcome their fear of Maths. "Friendly. Affectionate. Always encourages and boost up the morales of the student--irrespective of his intelligence and capacity of understanding. In-depth,thorough and analytical in his explanations and discussions. Brilliant command over the subject powered with interactive and innovative mode if teaching. Hardworking and believes in tireless striving. Regular, punctual, disciplined and consistent. Sincerely discusses the pros and cons of the students with respective guardians. Focused, dedicated and determined to bring upon the best from students. High on values and culturally sound. A true gentleman with excellent communication skills and compassionate nature. " "Losing interest in study is probably the most common problem children face. To be honest, my cousin is really intelligent but she would not invest in studies until I met Mr. Dutta and agreed my uncle to keep him as her tutor. His unique approach, friendly nature, support and most importantly study materials helped her a lot and now I see her doing her things without someone pushing her to do so. I would recommend Mr. Dutta without a hint of doubt. " "He is very good and experienced teacher. Very Cooperative and very good behavior to the students. " "Awesome experience. I got failed everytime since first standard, I could hardly write a complete sentence, it was the time when I really gave up hope for studying any further, then someone told me about this tuition classes, my parents who were much more worried took the chance. It was a golden era which changed my entire career. I got more & more interested in studies day by day & surprisingly my results improved. Thanks to the mentors / teachers who saved me and paved my career in studies. Best coaching begins here. Thank you dinyendu sir and others. " How much should I charge for 1st-5th STD student fees for all subjects if I'm taking classes at my home? Advising you to not to go for all subjects..
Can I be a part time Home tutor? I love teaching and can dedicate 3 hours on weekends for 4th standard to 8th standard students. Dibyendu Dutta describes himself as Maths and Science Tutor. He conducts classes in Class 6 Tuition, Class 7 Tuition and Class 8 Tuition. Dibyendu is located in Agarpara, Kolkata. Dibyendu takes at students Home and Regular Classes- at his Home. He has 20 years of teaching experience . 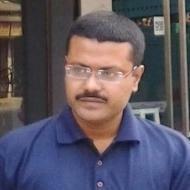 Dibyendu has completed Bachelor of Science (B.Sc.) from calcutta university in 1996. He is well versed in Bengali and English. Dibyendu has got 14 reviews till now with 100% positive feedback.